PopUp Calendar is MainTree Systems' 2nd program released to the public. 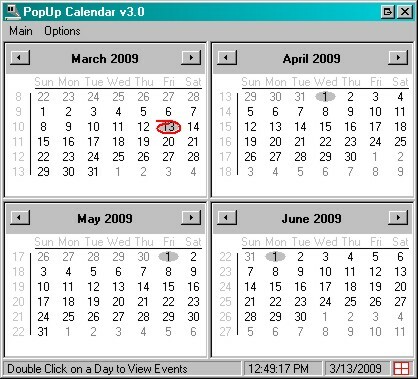 PopUp Calendar is a freeware application that puts something in the system tray that Microsoft forgot, THE DATE! PopUp Calendar can place either the day of the week, date, or both in the system tray. As a added bonus, when you click on the date a calendar will popup that you can use to look to see what day the 27th falls on. This is something that everyone needs at one point or another. Another option that PopUp Calendar has is a hourly chime option. You can either select one of the provided chimes, have the program say the time, or pick your own wave file. PopUp Calendar also has a daily and weekly repeatable alarms that you can attach any sound you want too. Download and try PopUp Calendar today! After all, it is FREE!